Attack of the Friday Monsters! A Tokyo Tale - ishotjr.com - Put a little mustard on it! Attack of the Friday Monsters! 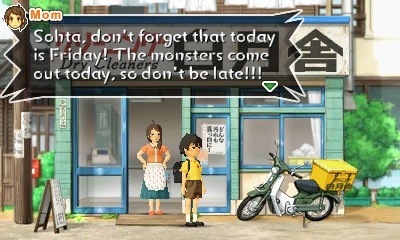 A Tokyo Tale is the latest 3DS eShop title from Japanese indi game dev Level–5. A cross between a Sierra graphic adventure game (The Adventures of Willy Beamish in particular comes to mind) and a Miyazaki film, it tells the story, over a series of “episodes,” of Sohta, whose newfound home in an otherwise quiet rural town is subject to weekly visits from kaiju (giant monsters), not all that dissimilar from the ones in his favorite TV show. Like Journey, this is a game as much about emotions and visuals as the gameplay itself – if not more. At $7.99, it’s cheaper than a movie ticket, and with several more hours of interactive enjoyment. I absolutely love these unusual, shorter, less expensive games, which require a lot less time and financial investment, yet still provide a great deal of entertainment and fulfillment – and in the case of Friday Monsters, a chance to experience childhood wonder once more.